Does Healthy Eating Have to Be Complicated? Many of us have become paralyzed by information overload about healthy eating. Katie Di Lauro, Katie Di Lauro is a registered dietitian nutritionist at Tri-City Medical Center, a full-service, acute-care hospital located in Oceanside, California. We all want to eat healthier, but amidst a profusion of conflicting evidence and advice from scientific studies, nutritionists, personal trainers, and questionable advertising, many of us have become paralyzed by information overload. Is a calorie just a calorie, or are some better than others? How much protein do we need, and from what sources? And what about fad diets, like juice cleanses or low-carb? The more we learn, the more questions we seem to have, but perhaps all this information is doing us more harm than good. Perhaps a simpler, more intuitive approach is necessary to transform our eating habits for the better, and for good. Fortunately, there is one piece of nutritional advice that can be universally applied and offers universal benefits: Eat whole foods. Different people require different amounts of calories and respond differently to certain ingredients, food preparation methods, and eating schedules, too. But everyone can benefit from eating whole foods. Not one scientific study advocates against eating unprocessed foods, and not one nutritionist argues their consumption leads to disease, or obesity, or chronic fatigue. These experts may differ widely on the particulars — this much protein, this much fat, this many carbohydrates — but all can agree that natural foods, which humans have evolved to consume and digest over millennia, are best. So now that we have a nutritional baseline from which everyone can safely work, what does this look like in practice? As we have established, choosing whole over processed foods as often as possible will inevitably ensure a healthy diet because these foods still retain their essential vitamins, minerals, and other nutrients, and have not been doctored with harmful chemicals. When you eat a variety of whole foods, in a variety of colours, your treat your body to a wide array of beneficial components. Red foods, for example, like red bell peppers or cabbage, contain lycopene, a powerful antioxidant associated with reduced cancer and heart attack risk. Blue foods, on the other hand, like blueberries and eggplant, contain the antioxidant anthocyanin, which is particularly potent for heart health. Eating whole foods also means you can spend less energy worrying about calories. We tend not to eat whole foods to excess because, being nutritionally dense, they are satiating. Protein and fibre in particular help in this regard. Processed foods, being nutritionally void by comparison, are not, and leave us craving more. Choose whole grains over refined grains, fresh fruit over sugary juices, and a wide variety of vegetables, preferably not pre-cut, as once a vegetable has been cut, its nutrients begin to degrade. Stock up on dried legumes and choose unroasted, unsalted nuts and seeds. It’s unrealistic to expect that you can avoid processed foods altogether, particularly if you wish to eat amongst friends and family or outside of the house, but these should not comprise the bulk of your food purchases. Aside from lacking protein and fibre — both of which promote fullness, and vital nutrients, which are necessary for a variety of bodily processes — processed foods are full of unhealthy fats, excessive salt, and refined sugar, all of which are highly addictive. It’s easy to overeat processed foods, yet, paradoxically, remain malnourished. It’s a simple fact: Everyone could benefit from eating more plants. Whether you eat meat or not, adding more produce to your meal is a good thing. Plant foods are the richest sources of vitamins, minerals, and fiber available to us, and contain countless disease-fighting phytochemicals more readily available to the body than those manufactured in a laboratory. Eating more plants also allows us to eat a greater volume of food, since fruits and vegetables have fewer calories than meat, dairy, and breads and pastas. Don’t know where to begin? Start with breakfast, generally the most carbohydrate-heavy meal in the Western diet. Try replacing your usual croissant or muffin with a green smoothie, an omelette with chopped vegetables, or a chia parfait, and see how your energy soars. 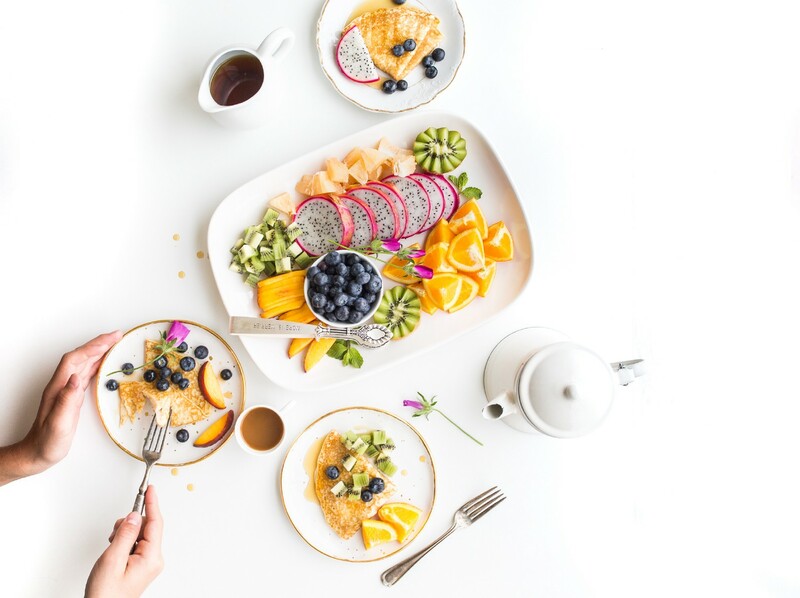 Depending on how often you cook meals for yourself right now, this may sound overwhelming, but by adhering to the below small, actionable steps, you can begin to establish a new routine that involves eating more meals in and fewer meals out. It may take time for these to become habit, but with patience, practice, and perseverance, you will get there. And don’t forget to forgive yourself when life does get in the way (because at some point, inevitably, it will). Planning ahead is what separates those who consistently stick to their nutritional goals from those who do not. While creating a weekly meal plan may sound tiring, even restricting, it’s a quick task that will ultimately liberate you from mealtime stress. Deciding what to make for dinner when you’ve just come home from work and are exhausted, starving, and rushed is not going to result in healthy, balanced meals, and it most certainly isn’t going to be fun — which means you may choose to avoid cooking altogether the next time around. Your meal plan is your road map. It should enable you to organize yourself ahead of time — to choose what recipes you’d like to make, to buy the food, and to do some preparation — so that you are able to come home already knowing what to make for dinner, with everything necessary to prepare it already in your fridge. It does not need to be carved in stone, however. If you planned to eat fish on Thursday but are craving it on Monday, allow yourself the pleasure of eating intuitively and adjust accordingly. When you create your meal plan, you should also write your grocery list. This will save you both time and money, as you will avoid wandering the aisles aimlessly, picking up whatever catches your eye, and ending up with a fridge full of disparate ingredients that don’t easily combine into meals. Also, avoid going to the grocery store hungry. This often leads to making impulsive, unhealthy choices. Every chef knows the importance of prep. Called the “mise en place,” which translates to “set in place,” it ensures that a little bit of work put in ahead of time yields big rewards come dinnertime. And it doesn’t need to be complicated. Try setting aside an hour or two a week on a night that is convenient for you. Cook a big batch of grains — brown rice, quinoa, or millet are all excellent choices — or legumes, steam or roast some vegetables, and prepare one or two dressings or sauces. When you’re ready for dinner, throw these ingredients together with some fresh greens, nuts or seeds, and a protein of your choice, and enjoy a well-balanced meal that took mere minutes to throw together thanks to a little foresight and planning. Your meal prep can also be more involved. By making a large batch of something at the beginning of the week, like soup, stew, lasagna, or veggie burgers, you ensure you have something to eat for the rest of the week. You can also freeze the excess for those nights when you truly have no time to cook. Good choices do not happen by willpower alone. They are the result of practice and planning. Establish healthy routines, plan ahead, and don’t wait until you are hungry to think about food. Katie Di Lauro is a registered dietitian nutritionist at Tri-City Medical Center, a full-service, acute-care hospital located in Oceanside, California. Katie brings her 14 years in the wellness industry, as an individual and corporate wellness educator. Katie is truly passionate about wellness and helping her clients achieve their goals through education, motivation, and accountability.